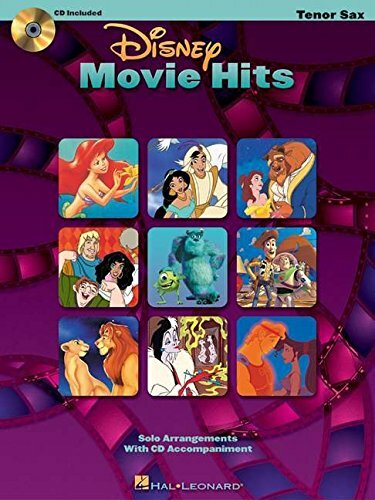 Disney Movie Hits arranged for Tenor Sax with accompaniments to download online. (Instrumental Play-Along). Now solo instrumentalists can play along with a dozen favorite songs from Disney blockbusters such as Beauty and the Beast , The Lion King , Monsters, Inc. , Toy Story 2 and other beloved movies. These book/CD packs include recordings by a full symphony orchestra of demo tracks and backing-tracks only so you can sound like a pro playing with the orchstra! Songs include: Beauty and the Beast * Belle * Circle of Life * Cruella De Vil * Go the Distance * God Help the Outcasts * Hakuna Matata * If I Didn't Have You * Kiss the Girl * Prince Ali * When She Loved Me * A Whole New World.